SIZE: weight about 12.25 ounces (350g). Crown-to-rump length at this time is about 7.6 inches (19cm). Mother's Size: Uterus now about 0.8 inch (2cm) above the bellybutton or almost 9 inches (22cm) from the pubic symphysis. Bones of the ear - hammer, anvil and stirrup - harden, making sound conduction possible. 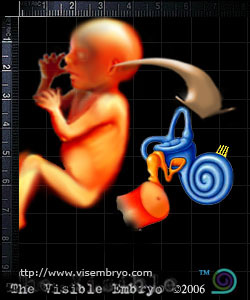 Fetus recognizes maternal sounds such as breathing, heartbeat, voice, and digestion. Respiratory system continues to develop; lungs are not yet able to transfer oxygen to bloodstream and release carbon dioxide by exhaling. Bones, muscles and organs are growing steadily. Blood vessels, bones and organs are visible underneath a thin layer of wrinkled, translucent, pink skin.